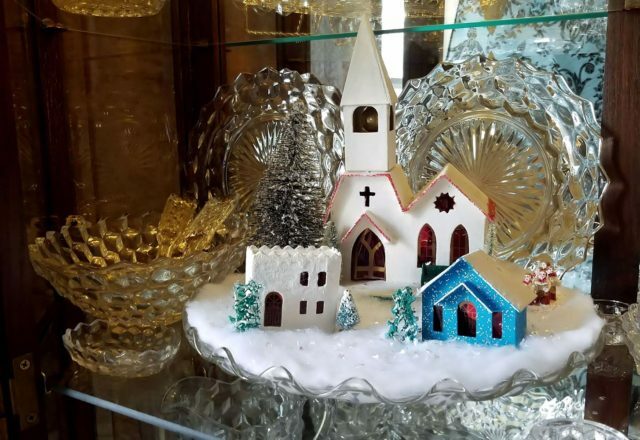 Please Note: the following is Part 4 in a continuation of posts regarding other American collectors and how they use Fostoria American for the holidays. This post is the final chapter in the series. Each one has been different – some have been simple, others have been more extravagant – but all have been full of sentiment and classic beauty. 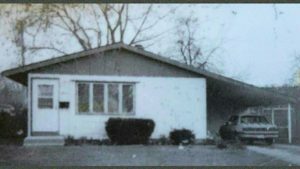 Popularity for Putz houses reached its peak during the 1920’s through 1950’s. 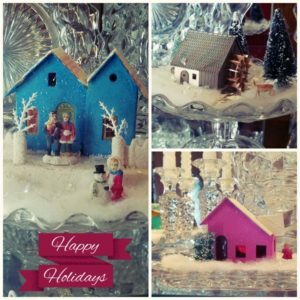 It was a German Christmas tradition that involved setting up a tiny village around the Christmas tree or nativity scene during the holidays. 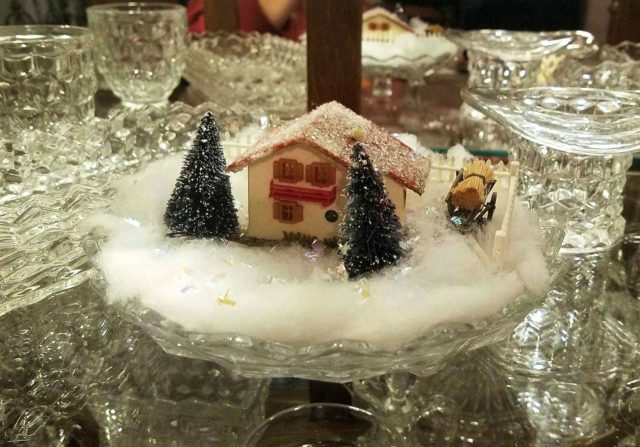 Members of the family would “putz” around, making sure that each scene was decorated correctly and each piece was placed properly. 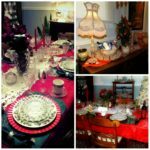 It was (and still is today) a wonderful family activity for decorating your home and sharing the magic of Christmas. The two pieces of American that Dawnna inherited were the Mayonnaise (without the Plate and Ladle) and the 3-Part Candy Box (without the Cover). Even without all their associated parts, these pieces of FA still had the power and lasting beauty to make a lifetime impression. 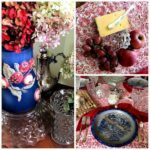 Since then, it is obvious that Dawnna has learned how to combine her beloved American and Putz collectibles into charming vignettes throughout her home. Using Fostoria American as the support and backdrop pieces, she is showing off both her collectibles to their best advantage. 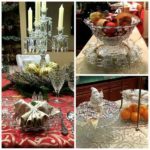 The iciness and coolness of the clear American glass really sets the scene – adding to the festive and winter atmosphere! 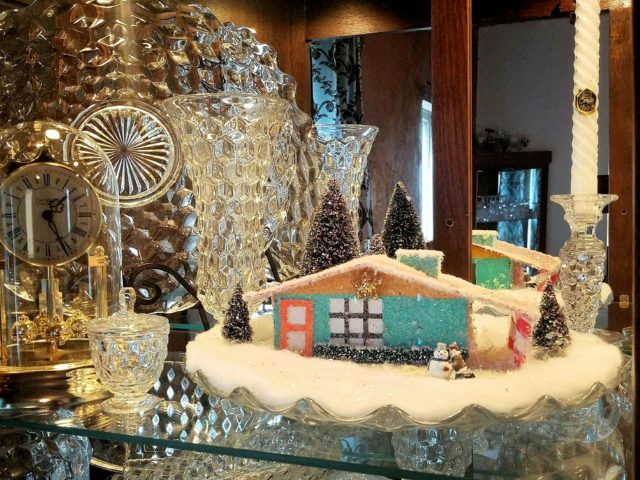 For those of us who love vintage Fostoria American, and in this case – Putz houses, the Christmas season allows us to treasure our own past. It also allows us the opportunity to preserve history by rescuing and displaying vintage treasures. By doing so, we are honoring our ancestors that came before us, while playing an important role in preserving our own family antiquity. 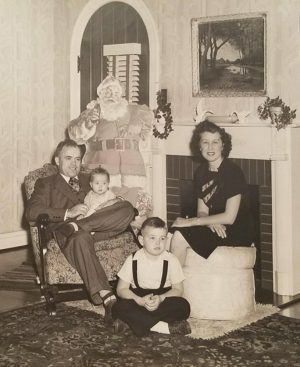 Here is a Christmas card photo of Dawnna’s grandparents, taken in 1947. Her grandfather is holding her father (his first Christmas) and her uncle is sitting on the floor. I believe Dawnna’s love of Fostoria American, and the Putz houses she inherited from them, is a result of the wonderful experiences her parents and grandparents provided to her in her youth. It had nothing to do with the quantity or rarity of the pieces that she was bequeathed. It did; however, have everything to do with the love, history, and memories that they represented. As the years have passed, and her collections have grown, it appears that Dawnna is now passing on that heritage to her young son. It is a pinnacle moment, and a shining example of true Christmas spirit. Thank you for reading this final and very precious holiday story. A very special “Thank You” goes out to Dawnna Crick-Strassenburg of Illinois. If you like what you have read, please be sure to let us know your comments on Facebook. Thank you, and Happy Holidays!